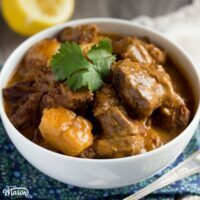 Love beef massaman curry? Me too! 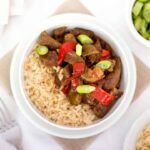 Originating in Thailand, this incredible recipe is CRAZY delicious, with fall apart beef, packed full of flavour and is basically a dish that you absolutely need in your life! And guess what? 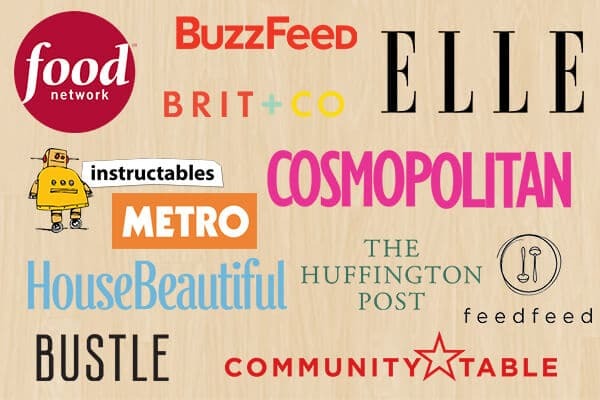 I’ve made it super simple for you to recreate using just your slow cooker. You don’t even have to brown the beef first. (Just like my slow cooker mongolian beef recipe.) 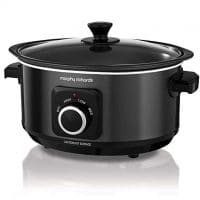 I LOVE slow cooker recipes like that! The beef just fell apart and the flavour was incredible! I can also tell you that my house smelt AMAZING when I walked in after a long day at work. I couldn’t have asked any more from this hearty and delicious dish. The Mr even went in for seconds. (He never does that, EVER!) It’s honestly one of the tastiest things to ever emerge from my slow cooker. SO much flavour!! 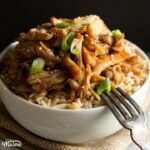 Speaking of, if you love seriously tasty Asian recipes, you have to check out my easy slow cooker chicken teriyaki recipe too. It’s just as amazing! It can also be quite cheap for a beef dish. I used the lower priced pre-diced beef cuts and it still melted in my mouth. I believe that ‘low and slow’ cooking can turn even the cheapest cuts of meat into a delicious meal that everyone can enjoy. You can also now buy premade curry pastes which will save you loads of pennies not having to buy 20 different spices/herbs for your cupboard! I highly recommend using coconut cream over coconut milk. The flavour is much richer and, no surprises, much creamier! It really does make a difference. If you need to use coconut milk however, only use 400ml as it’s much more runny. Make sure your potatoes and beef are cut to approximately the same size. This just ensures even cooking throughout the whole batch. When making the beef massaman curry sauce, I like to use a whisk to mix it. This guarantees even distribution of all the flavours and no lumpy bits. Panicking that the sauce looks a bit pale? Don’t! It will become much darker during the cooking. It gets WAY more appetising I promise! With the added potatoes, this curry is almost a meal in itself. That being said, you can serve it on it’s own, with some rice or dip in some naan bread. All options are totally yummy. You’ll notice that I don’t add salt anywhere in this recipe. That’s for two reasons. 1. Fish sauce is very salty! 2. In Thailand, they don’t use salt to season their food. They use ingredients like fish sauce, fresh lemon or lime juice and freshly cracked black pepper if you want to add a little heat. Be VERY careful with the fish sauce. It’s incredibly powerful stuff and you really don’t need a lot! 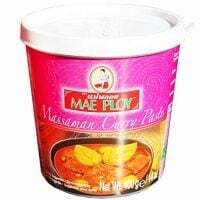 Want to know where to find massaman curry paste? I found a 200g jar in my local Tesco (in the UK.) I’m positive it’s readily available from other large supermarkets too. Not ready to brave the fragrant flavours of Thailand? 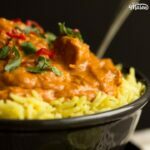 How about trying my simple slow cooker chicken curry recipe instead? Using more familiar flavours may be a good place to start if you’re a bit of a curry virgin. Or are you ready to just dive straight in? Let’s go! 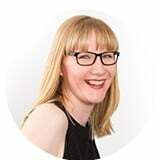 *I used Jazzy potatoes – they’re a bit like baby potatoes. Any kind will do though! Then , if you haven’t already, dice the potatoes (320g | 11 oz) and finely chop the onion (x 1). Try and keep the potatoes roughly the same sort of size as the diced beef if you can. Now place them into the slow cooker. Time to make the sauce! Lets add the massaman curry paste (200g | 7 oz), chicken stock (400ml | 1 + 2/3 Cup), coconut cream (500ml | 2 Cups), fish sauce (2 tbsp), lemon juice (1/2 lemon) and the brown sugar (1 tbsp) into a large bowl. Give it all a really good mix with a whisk to take out any curry paste lumps. Pour that beautifully fragrant sauce into the slow cooker over the potatoes and onions. Then add in the coated beef. If any pieces are stuck together, just carefully pull them apart. Avoid the temptation to stir it and just place on the lid. Cook on low for 8 hours. See – didn’t I tell you the colour would get darker and much more appetising? All that’s left to do is stir it well and serve. It’s entirely up to you whether you have it on it’s own, with some rice or with some naan bread (or similar) to dip into it. Sprinkle with a little chopped coriander if you’re feeling fancy. This is a freezable curry but it’s worth noting that the potatoes will change texture slightly once defrosted and reheated. They tend to become a little mushier. (Technical term!) I promise it will still taste just as delicious though. Simply pour your curry into freezer bags or plastic tubs (I like to reuse the plastic tubs you get with chinese and curry takeouts) and make sure you cover the potatoes and beef in sauce to avoid freezer burn. 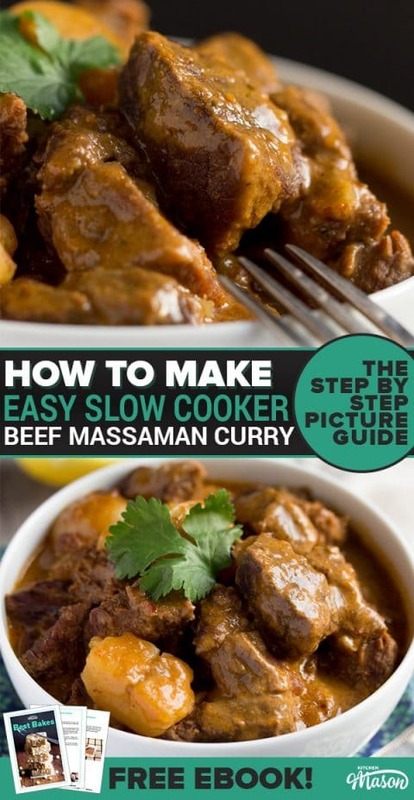 Defrost your beef massaman curry thoroughly in the fridge and use within 24 hours. To reheat, simply heat through in a saucepan over a low heat until piping hot. 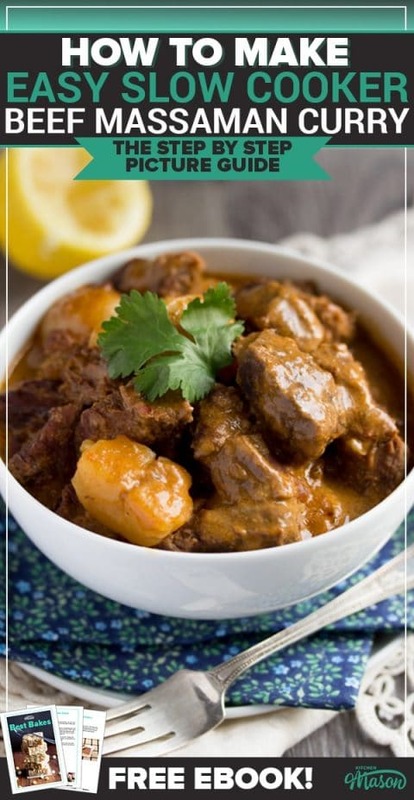 Packed full of flavour, melt in the mouth beef and hearty potatoes, this beef massaman curry is not only very easy to make but incredibly tasty too! Coat the diced beef in the flour and set aside. Place the diced potatoes and finely chopped onion into the bottom of the slow cooker. To make the sauce, whisk together the massaman curry paste, chicken stock, coconut cream, fish sauce, lemon juice and brown sugar until runny and dissolved. Pour the massaman curry sauce over the potatoes and onions then add in the floured beef. Do not stir. Put on the lid and cook on low for 8 hours. I used Jazzy potatoes (a little like baby potatoes) and pre diced beef for this recipe. Could you leave out the potatoes and just use the beef, onions and sauce ? Thanks Emma, that’s really helpful. 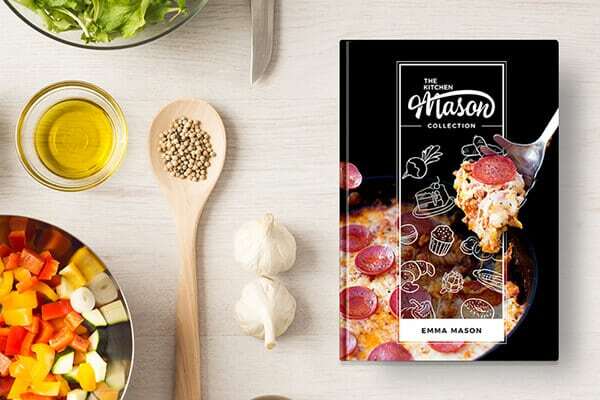 So glad I found your website, my family are really enjoying all the recipes I’m making, especially the teriyaki chicken ! Can I cook this in an Aga? How long for please? You weren’t wrong! The smells and tastes so good!